The Earth Cache is located in Babcock State Park When you get to the park, place your vehicle in the parking lot by the gift store and proceed on foot towards the creek. The posted coords will take you out into the river on a nice flat rock that gives you a great view of the falls and the Grist Mill above them. Please be careful as you make your way out to GZ. 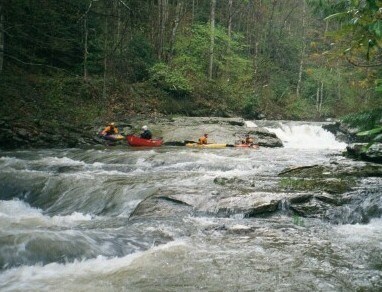 According to American Whitewater Glade Creek is a five mile long tributary of New River that is considered Class IV difficulty. pH is a measurement of how acidic or how basic (alkaline) a solution is. When substances dissolve in water they produce charged molecules called ions. Acidic water contains extra hydrogen ions (H+) and basic water contains extra hydroxyl (OH-) ions. pH is measured on a scale of 0 to 14. Water that is neutral has a pH of 7. Acidic water has pH values less than 7, with 0 being the most acidic. Likewise, basic water has values greater than 7, with 14 being the most basic. A change of 1 unit on a pH scale represents a 10 fold change in the pH, so that water with pH of 6 is 10 times more acidic than water with a pH of 7, and water with a pH of 5 is 100 times more acidic than water with a pH of 7. You might expect rainwater to be neutral, but it is actually somewhat acidic. As rain drops fall through the atmosphere, they dissolve gaseous carbon dioxide, creating a weak acid. Pure rainfall has a pH of about 5.6. 1) What is the pH level of the stream? 2) Why do you think you got this level? 3) What is temperature of the water? 4) What effect to you think this has on the pH level?